Israel's nuclear-capable INS Tanin able to operate deep within enemy territory - to lethal effect. New footage from the Israeli Navy showcases the most advanced submarine in the IDF's arsenal: the Dolphin-class INS Tanin (Crocodile). The nuclear-capable submarine boasts an array of sophisticated weaponry, as well as the latest in intelligence-gathering technology. It stands at a whopping 68 meters long, compared to 57.3 meters on average for other submarines. 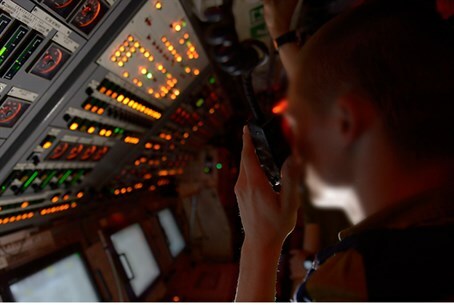 "The submarine will receive more long-term missions, and for a greater amount of time, than submarines" the IDF possesses, one navy officer explained, adding that as a result the Navy had "extended by several days our ability to operate silently and secretly in enemy territory." The submarine's commander, Lieutenant Colonel "G", echoed those sentiments, adding that as a result of the sensitive nature of the missions it will be undertaking only the most elite navy personnel will be operating it. "Even the smallest mistake by a soldier could foil the mission in the best-case scenario, and in the worst case reveal the submarine and leave it vulnerable to attack," he said. Sailors worked closely with the defense ministry, intelligence agencies, the air force and other elite IDF units, he added. Commander of Haifa naval base General David Salamah explained the importance of Israel's submarine fleet to national security. Israel's submarines regularly operate "deep within enemy territory", he noted. "We are talking about a major upgrade to the navy and the entire IDF, in the face of the challenges posed to the State of Israel."